I had booked a ticket to go home for a family event well in advance. But some wave made me prepone the trip by a day. My initial ticket was for a Saturday, but wanted to prepone it to a Friday. Its a Friday during peak vacations! As expected, all tickets on almost all buses were sold out. I kept searching for that elusive ticket, and suddenly noticed one full row becoming empty in the Kallada B9R to Ernakulam via Kozhikode. Did not think further, as I lapped up the seat. I booked through a third party website, making the ticket slightly affordable for me. I was carrying a lot of luggage this time. I had a huge trolley suitcase with me. Walking from home to the auto stand was not an option for me with all the luggage. I went to the auto stand in my vehicle, called an auto from there, and came home to pickup the luggage. The security at our building did not allow the auto guy inside, and I had to pull all the luggage out of the building and load it into the auto. The driver was complaining all the time about the attitude of these security guys at various places. It was an old guy - a very old guy, who took a driving license even before I was born! He was a truck driver, it seems, earlier. The driver took the conventional route from my home to Madiwala - instead of taking any shortcuts. We hit a massive traffic block at Bommanahalli itself. Every minute was agonising as we crawled towards Madiwala. I was finally dropped at Madiwala Checkpost office of Kallada at 2005hrs - just in time for the bus. While in the auto, I noticed that almost every travel agency in Madiwala resembled a war-zone - it was crowded to the core. The Kallada offices were no different. I was seeing such a crowd for the first time at the new office - it was packed to the core. There was a long queue to get the boarding pass itself! I, for some reason, decided not to play good citizen - directly approached a known person there, who happily wrote a boarding pass for me. The bus number written was "4186". I was uncomfortable reading that number - for some unknown reason. 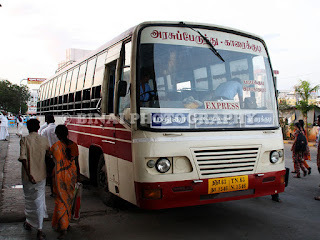 The bus was coming from Kalasipalayam, and they said the departure is past 2030hrs only. I had a nice lemon tea from the shop there, and stocked up some biscuits from there. The bus: KA-01-D-4186. Taken after the breakdown. The bus came in at 2024hrs - boarding started immediately. I left my baggage in the luggage hold and got inside. We had heavy bookings from Madiwala itself! My seat was at the back - K4, window seat on the right side on the last-but-one row. My co-passenger, this time too, was to Ernakulam! I asked him if he booked by mistake - no! He knew the route, booked because there weren't any other options! Checking started soon after boarding settled - we finally started off at 2042hrs - that is a delay of 27 minutes. The roads were jammed up in the opposite direction - it was empty for us though. The driver picked pace as we passed Christ. It started raining as we passed Lalbagh. The driver took right at Minerva circle, and went via Town Hall junction, taking a left below the market flyover. We reached Kalasipalya at 2107hrs. It was raining cats-and-dogs at the moment. Boarding was messy due to the rain. There were very few passengers to join us here. We started off at 2116hrs. Mysore road was hell - as usual. The rain added to our misery. In the meantime, they started playing a movie. The engine was making an unusual noise - similar to that of a tractor! The ride was comfortable - even for a 4 year old bus! The seats weren't the usual VFX, but the sundry "Magnum" model. They weren't very comfortable - but the angle of recline was good. We picked up a passenger at Kengeri (2200hrs), and continued our run. The bus stopped for dinner at the usual place past Channapatna, at 2253hrs. Its not a great place - I did not want to have dinner anyway. A counter outside the hotel was selling hot Pazhamporis (Ripe banana fried) - I certainly did not want to miss that. Downed a couple of them, and them got back into the bus. We started off at 2314hrs. The movie resumed after the break. I slept after the movie got over - it was still raining then. I woke up sometime in the night when the bus hit a pothole and almost threw passengers around - it was raining heavily even then. The driver did not seem to a regular on that route, since he wasn't very careful about the road. I fell asleep again - one good continuous sleep from then. I woke up just as the attendant shouted out "Kozhikode... Calicut". We had just passed the Moffusil bus station then, and had turned on to MM Ali Road. 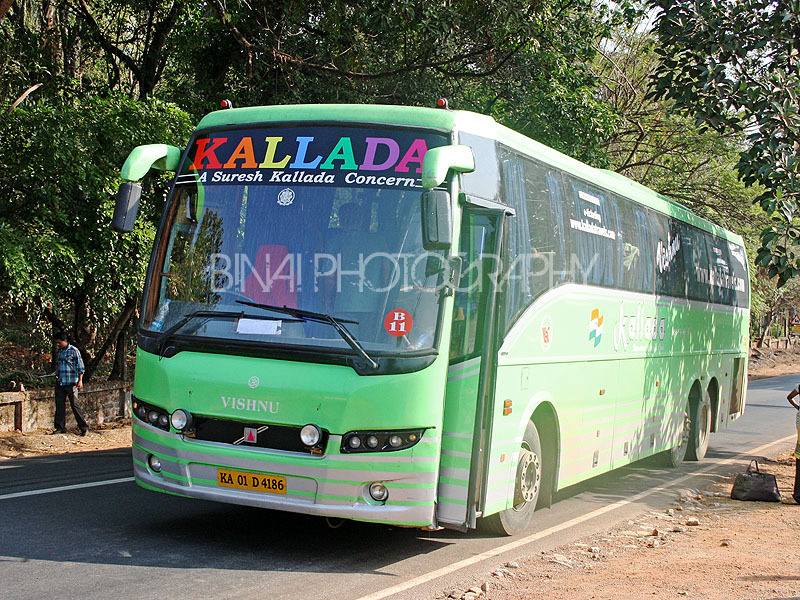 The bus stopped outside the Kallada office there, at 0614hrs. Very few people got off at Kozhikode - a sharp deviation from the past! I was awestruck at this. Four passengers got in at Kozhikode, and we started off at 0618hrs. The bus stopped for fuel at a fuel station at Mankave (0623hrs). It took some time for our turn - the bus took in about 100 lts of diesel, and we started off at 0631hrs. I slept soon after the bus started off. I vaguely remember seeing Ramanattukara - I had a heavy hangover, and just continued sleeping. I woke up sometime later seeing the bus stopped outside a tea stall, in the middle of the road! I was wondering what was happening - the engine was being revved up and down, and it was smoking badly. Then we started again, but crawling up a gradient. The bus stopped again, this time out of the road (0655hrs). They shut the engine, re-started it, and kept revving it. It was white smoke all around, and the engine made unique noises. I got off the bus to find out what was wrong - the driver said there was an air lock. They were manually pumping fuel and trying to revive the fuel line. We started off at 0710hrs. The initial run was fine, but the bus started crawling again - so bad, that a local bus overtook us with ease! The bus was stopped again - we were past Kakkanchery, near the university then. This time the engine shut down, and wouldn't restart in any case. I messaged a contact of mine about our condition. Around 8AM, he calls me up and gathers some information about the breakdown. He disconnected the call, and later talked to the crew. He updated me again about the breakdown, and promised that a replacement has been arranged. In the meantime, the crew received a call with details of the replacement bus (a travel agents' number). After playing around for some time (the crew were in touch with Kallada's mechanics on phone, and they were instructing the driver step-by-step), the engine came alive. This time it smoked very less, and the sound was better. Finally we start off again at 0811hrs. Three minutes later, the bus broke down again, this time in the middle of the road, right outside the Calicut University. I called up my contact again, who then spoke to the crew and instructed them to call the replacement immediately. They did as instructed. The drivers were apologetic - they behaved very calmly to the passengers and even helped them get their baggage out of the baggage hold. 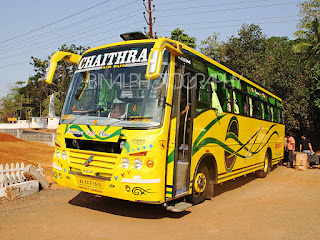 Our replacement was a non-AC 2+3 seater contract carriage bus, "Chaithram". I struggled with my huge bag - put it in the dickey, and got into the bus - only the last row was vacant - took a right side window seat. We started off at 0840hrs. The driver was in no hurry, as he drove in typical "CC" style - crawling! I slept for some time. We stopped at Kuttipuram (0957) to drop a passenger and quickly continued. I continued my sleep. Woke up just as we stopped again - Edappal (1009hrs), again for a drop. By now, some people at the front wanted to have their breakfast - the driver stopped at a couple of places, and continued. We finally stopped at a restaurant called Rice N Fish, a few kms before Perumbilavu (1030hrs). The restaurant was just waking up - it a typical non-veg joint, that normally wakes up for Lunch. The interior ambiance was good, but the service was lousy - cannot complain, since they were just about opening! The break took a lot of time - we started off again at 1131hrs - a good one hour at the hotel! The driver picked up pace after the break. We passed Kunnamkulam at around 1145hrs. 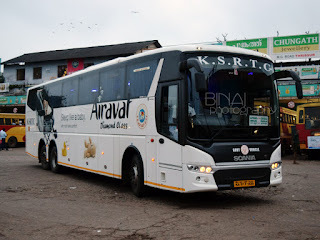 We stopped at Guruvayur to drop a few passengers (1210hrs), and also unload some parcels. It was quick though. The driver then maintained pace as we ran through the narrow roads between Guruvayur and Chettuwa. The road becomes wider after Chettuwa - and we picked pace afterwards. I called up home and arranged for my pickup. I was finally dropped at Kodungallur, at 1327hrs - a good 5h07m late!! 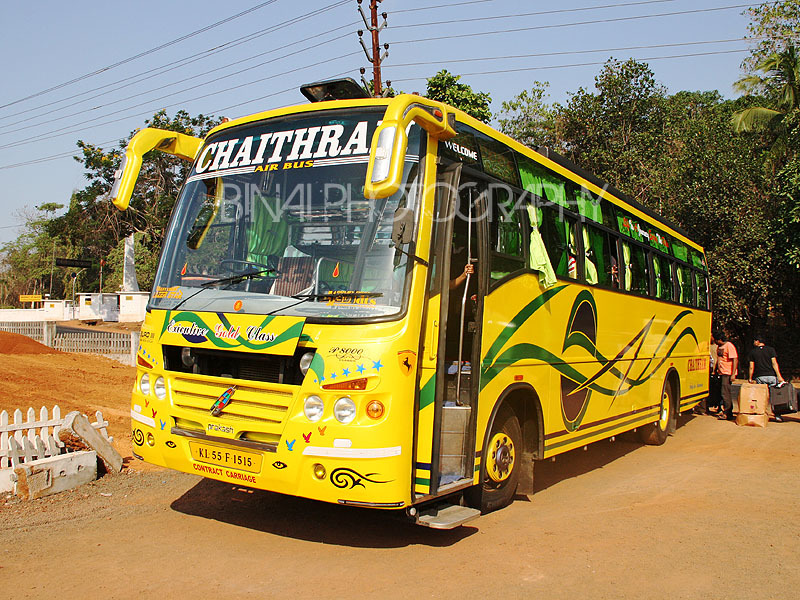 End remarks: The bus, KA-01-D-4186, was about 4 years old and had clocked 8.49 lakh kms. The maintenance was above average - the interiors were in good shape. I wouldn't comment much on maintenance, since the bus broke down! The crew said the bus had the same problem a few days back - it seems they took bad fuel from somewhere, and that problem is recurring again and again. I found out later that they had to clean the fuel tank and change the fuel filter and fuel line to repair the issue. The running time from Bangalore to Kozhikode was the announced 9hrs only - an amazing sleep friendly ride. What followed was a disaster. But I appreciate the fact that they arranged a replacement, at least. I was glad that we did not have the breakdown inside the forest or in the ghats! The crew were well behaved as well. The end-to-end journey took a grand 16h45m for a 560-odd kms journey!! Will I take this service again? It is not a route for end-to-end riders. 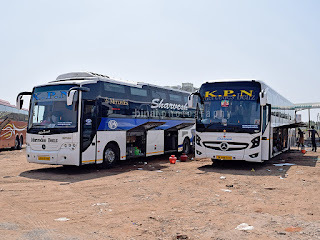 Its an amazing service for Bangalore-Kozhikode passengers - surely recommended!